Any idea where I can find a floor lamp base for my stained glass lamp? I noticed you have table lamp bases. Thought maybe you would know…. Not sure but you could try Lamps Plus, we can not get floor lamp bases through our suppliers. I have an antique lamp with a bad switch. Can you repair it? Most likely. Please bring it into our store for an estimate. Please bring it in for a free repair estimate. I have an ocholla cactus lamp that needs a new three-way switch and hopefully re-energize the light rope that up inside The skeleton. We can do that! Please bring it into the store for a free estimate! 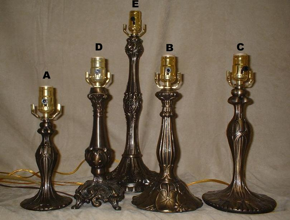 I have a brass Stiffel table lamp that needs replating and a new 3-way switch on the base. Can you make these repairs? We also have a small Tiffany style lamp that is missing the hart to attach the glass shade to the base. Can you help us with these two lamps? We have replacement harps in many sizes so we can help you with that one. 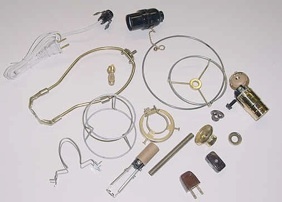 We can replace the switch for you but you will need to contact Metro Plating in Mesa to get the plating redone. Hi my moms ceramic lamp broke in half would you be able to repair and if so how much would you charge? Hello, I am sorry but that is not a repair that we can do. We have a holtkoetter floor lamp without a dimmer- it turns on when plugged in. Can you repair it? Yes we should be able to repair that one. Please bring it in for a free estimate. Hello Connie, yes we have replacement parts for the touchlamp control. Yes we can do that. Bring your bag into the store to discuss the project and to determine if it can be done. I have a plastic floor craft lamp that works but the weighted base, some sort of concrete is crumbled apart. Do you have some sort of weighted base material that could be installed to keep the lamp upright? We have a few steel weights that we could try if they are the correct size. Bring it in if you want to and we can try and match it up with a steel weight. Do you repair ott light floor lamps? Yes we can repair most lamps but you should bring it in for an estimate. Yes we can rewire those lamps and the cost would be around $40 per lamp.